Ridge Gourds are one of those vegetables that I see in the grocery store and feel a little scared of – I wonder how to break through its green, spiny skin, why it’s sometimes called Chinese Okra and if that’s the same thing as ridge gourd (it is) and how my mom manages to transform this ugly, intimidating vegetable into a velvety, nutty and rich chutney. I finally mustered the courage to buy two ridge gourds from the Indian grocery store, and it turned out to not be so scary an endeavor after all. We like to mix a heaping amount of ridge gourd chutney with plain rice, and if we weren’t living in the era of heart healthy eating would probably add a teaspoon of ghee in it too. It’s also a good side for curd rice/dahi chawal/curried yogurt rice. 1. Cut the ridge gourd into 2 pieces or 3 so that is a manageable size to work with. Peel the skin using a hand peeler. If the vegetable is fresh, then it�EUR(TM)s not so difficult to peel but some parts of the skin may be dry and therefore a little tough to peel. But keep at it! I find it easier to drag the peeler right down the ridge. 2. After peeling, slice the ridge gourd in half lengthwise. 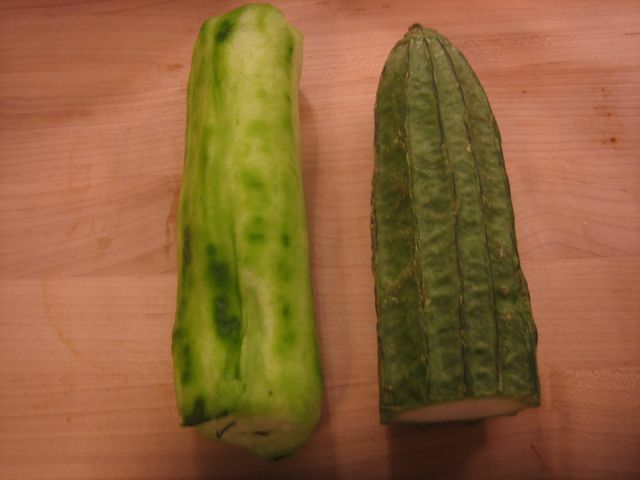 If the ridge gourd is a little older, there may be big, palpable seeds on the inside which should be removed. 3. Dice the ridge gourd into small cubes. 4. Heat about 1 tspn. oil in a large skillet. Add the urad daal and red chilies and fry for a few minutes until the urad daal is golden being careful to not let it burn. 5. Add the cubed ridge gourd and shower with about 1 tspn. to salt. Cook for about 20 minutes until the ridge gourd starts to look translucent and cooked through. 6. After allowing to cool, add the entire mixture plus the coconut to the blender and blend without adding an extra water (the ridge gourd will give off a lot of water as it cooks and this should be enough for blending) until you have a paste like consistency. 7. Meanwhile, pop about 1 tspn. of mustard seeds in the same skillet. Add the paste back to the skillet with the mustard seeds. Mix in tamarind paste. 8. 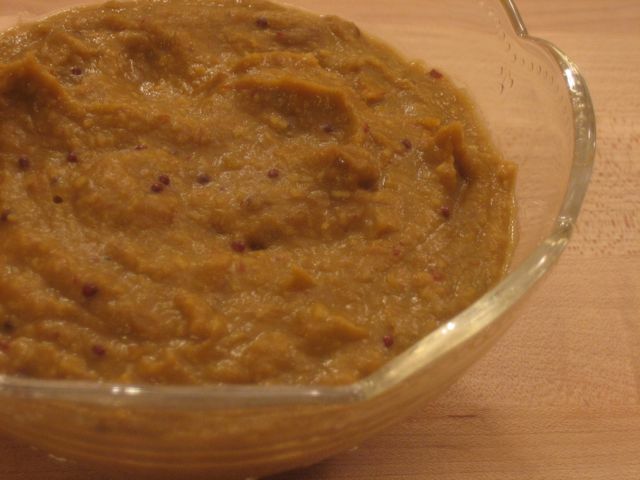 Continue cooking on low heat for about 5 minutes – if the chutney is too watery cook until a smooth, thick-ish consistency is reached. 9. Mix with warm rice until the rice is well coated with chutney and enjoy. *You can use grated fresh coconut instead of coconut powder, but adding coconut is optional altogether. A few other interesting ridge gourd recipes that I found are this one for a ridge gourd subzi from One Hot Stove and this ridge gourd stew-like curry recipe from Saffron Hut. Fun fact about ridge gourds – luffa sponges that are used for exfoliating come from the vine that ridge gourds grow on…who knew? Great blog and recipes Nithya! I would like to introduce you to Foodista.com – the cooking encyclopedia everyone can edit – and invite you to link your blog to foodista-related pages using our small embeddable widgets. Check it out here.. This is a good way for you to build traffic and connect with other food lovers! Also feel free to share your recipes and tips with us!Thanks! this certainly seems like a good recipe. my husbans hates this vegge but in the baove form, he wont have to see wht he is eating and just enjoy the flavour. Sonal, tricky but let me know how it turns out and if he’s fooled 🙂 good luck! Thanks for the recipe. I was looking for one that calls for less coconut. I tried yours and it is delicious! ND: So glad you liked it – my mom will be ecstatic. She’s always trying to get my dad to use less coconut.